You can scrap entire albums on your phone. There are plenty of apps available and they're easy to use. So they say. There are many articles that say it and Facebook groups full of obsessed people who think you must do everything on your phone or you will go to Hell. Bonkers. Yes, you can do all sorts of stuff on your phone but I don't see that that's a reason to ignore all the wonderful things you can also do on your computer. Making basic photo layouts on your phone is cool but whatever the Obsessed Ones say it can be a right pain adding text, embellishments and shadows in a dozen different apps while working with a tiny screen. 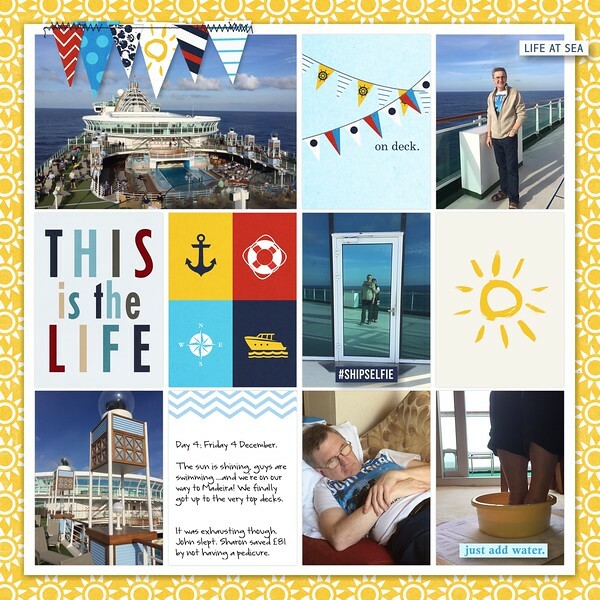 On our Ventura cruise in 2015 I decided to have a go at making the album while we were on the ship. I used the Project Life app and journal/filler cards I'd loaded (ie as photos) onto my phone before we left. 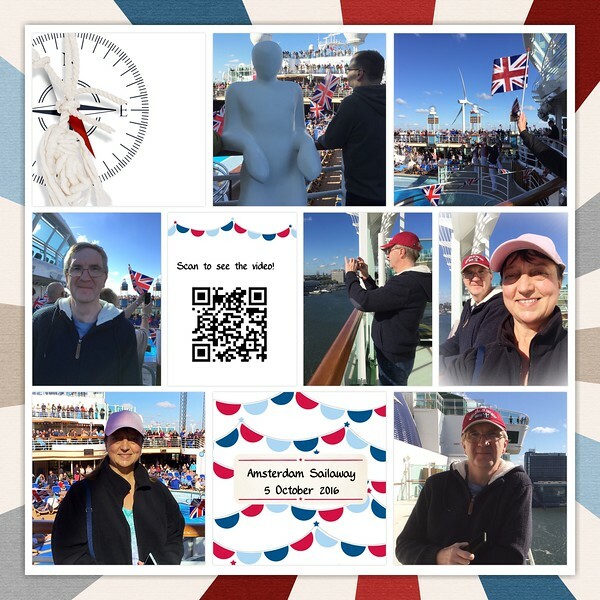 I added text temporarily using the Project Life app so that I could upload them to Facebook and show everyone (ruinously expensive wifi permitting) but the text function is awful to work with so I re-did most of that in My Memories when we got home. I added various elements - not many, just enough to give the pages a bit of a 3D effect and added a background to each page. I do that with all my pocket pages. There's a tutorial here. Here's just one example of a page I made. You can see the album on Smugmug HERE. 1) Aviary for editing and adding effects. You can use the Transform function in this to adjust the perspective and make building straight so you don't need other perspective apps. 3) Collect for making Polaroid-style pictures with text. Tutorial HERE. 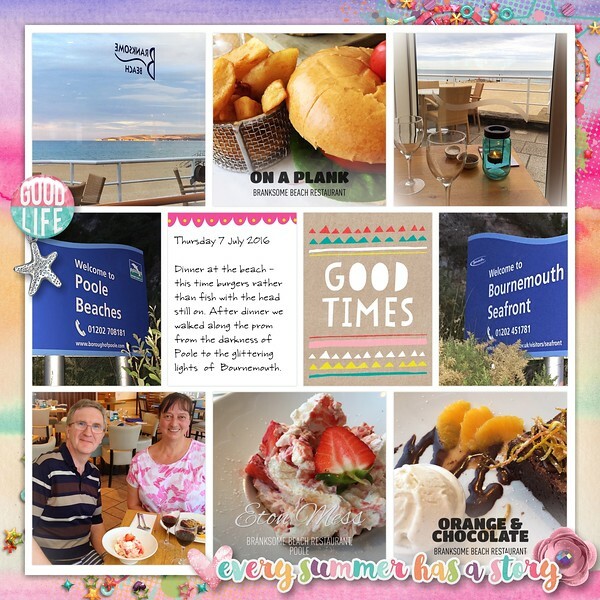 4) Instaweather and Instafood. You can remove the logo from these, check the settings. 5) TaDaa is fun for blurring the background. 6) The Photo Transfer App for copying photos from your phone to computer and vice versa. This is the best thing since sliced bread. Tutorial HERE. 7) Amazon Drive app for backing up your photos when you have wifi. If you have an Amazon Prime account you can store unlimited photos free. 1) Take a gazillion photos, obviously, and back them up as you go and don't forget to take some with a point and shoot camera in case you lose your phone. If you have wifi back them up to the cloud (I use Amazon, see above) or there are storage gizmos. I bought the Sandisk which other people swear by but I've never managed to get it working. 2) Add journal cards and maps etc before you go. Also make sure you have a photo of your passport and medical information. 4) Take a watch! Yes, this article is about using your phone but phones have a devious habit of choosing the time zone you're in and it might not be the same as the ship's time. You can turn this off but....trust nothing. Make sure you set your watch to the right time. The steward will put a card in your cabin the night before where there's a time change. The "cast off" command will be given according to the time on the bridge and that might not be the same as your phone. Missing the ship will be the most inconvenient and expensive thing you have ever done. 5) Don't forget to take photos of the inside of the hotel room/cabin (before and after you make a mess...) and each other. Also take photos of the view from where you're sitting or through the window but not just jaw-dropping views, take ordinary shots too. 6) Take a folding selfie stick (one that plugs in to the phone, you don't want to be footling about with bluetooth) but don't be shy about using the old fashioned method of asking someone to take a photo for you. 7) Do not drop your phone over the side of the balcony! You can get cases which include a hole for a wrist strap. 8) Turn off international roaming in settings to avoid a huge bill when you get home. 9) Don't forget to take some movies. You can always add a QR code to your pages when you get home (or no doubt use an app...). Tutorial HERE. 10) Mix it up a bit. Add "ordinary" pages in your album along with those made in the app once you get home. A page with one large photo looks great next to one with lots of photos. Here's an example of enthusiastic use of the Insta Food app. It also has pictures through the window - see tip 5 above - which is why the name of the restaurant is the wrong way round. People think I made a mistake with the text! Note the photo of us taken by the waiter. Waiters never mind taking photos and they get good at it. This page was a little dull when it came off the phone. I think the coloured background and title added some zest to it.